It was 'A TALE AS OLD AS TIME...' Our three ‘Belles’ found life tedious in her small provincial town and escaped by reading her beloved books and day-dreaming of a life of adventure! But she never anticipated being trapped in a castle with an assortment of animated household objects and a ferocious Beast! But things were not as they seemed in the castle... and Belle learnt to never judge a book by its cover. Disney's Beauty & the Beast jnr was a fantastic tale of marvellous characters, songs and dancing! And we all lived happily ever after! THANK YOU HOBART for 2 WONDERFUL SEASONS! 42ND STREET and BRING IT ON were absolute crowd-pleasers during September! 42nd Street had show-stopping dance routines by award-winning Mandy Lowrie, a cracking band led by Iestyn Parry with vocal direction by Maggie James with funny, romantic and engrossing action directed by Leiz Moore and Allan Jeffrey. Bring It On was Jaime Mollineaux-Herbert’s directorial debut as well creating energetic, funky routines with cheerleading by Ayesha Chilcott. The cool band featured emerging professional musicians led by Maggie James who was also vocal director assisted by Cassie Ogle and Finn Carter. We at Musical Theatre Crew is delighted to have worked with such a fantastic team of students, their families and theatre professionals, and loves creating these opportunities to showcase young Hobart talent! - 'Onstage' & 'Centrestage' classes - open to all without audition, ages 6-11yrs and 12-16yrs. Try the first class free in 2018! - Dancing for Musical Theatre - start in 2018! THANKS HOBART - FOR SUPPORTING THEORY! Crew was delighted to back young adult emerging artists, by producing the funny, soulful and engaging 'Theory of Relativity' musical at the Peacock Theatre, 10-19 May 2018. The show was co-directed by Crew Alumni Finn Carter teaming up with Jack Lark, and starred well known ex-Crew grads Martine Holliday, Cassie Ogle and David Abbott. We had fun over the rainbow! Thanks to the hundreds and hundreds of people who supported the Junior Crew's production of The Wizard of Oz! We had great adventures and learnt the value of friendship and family, and that we can do many things we couldn't - if we just look inside and trust ourselves! Thanks for loving MILLIE - it was so much fun and the feedback was wonderful! Winner of six Tony Awards, including best musical, Thoroughly Modern Millie is the delightful, smash-hit comedy set in New York's roaring 1920s based on the hilarious Oscar award-winning film. Millie, the 'modern' fast-talking flapper, knows what she wants... a wealthy man! The show delivers an evening of madcap merriment and features spectacular dance routines and catchy songs. "So beat the drum 'cos here comes Thoroughly Modern Millie NOW!" Supercalifragilistic Crew talent took flight in MARY POPPINS! Congratulations to current and past Crew members: Shannae, Brigitte, Phoebe and Oscar (above), Katie Green as Mary Poppins, Maggie James at alternate Mary Poppins, Campbell Braithwaite, Ben Smith, Tom Hawkey, Emilia Hawkey, Caitlin Carnaby, Bonnie Cashion, Tayla Moschogianis, James Bourke, MIa Grant, Louise Mackintosh, Madeleine Jeffrey-Moore and props Mistress Helen Cronin onstage as Mrs Brill! Musical Theatre Crew Principals, Allan Jeffrey (left front) and Leiz Moore (centre front) are also co-producers of The Show Company, with colleagues Mark Wojcik (l back) and Petr Divis (r back). 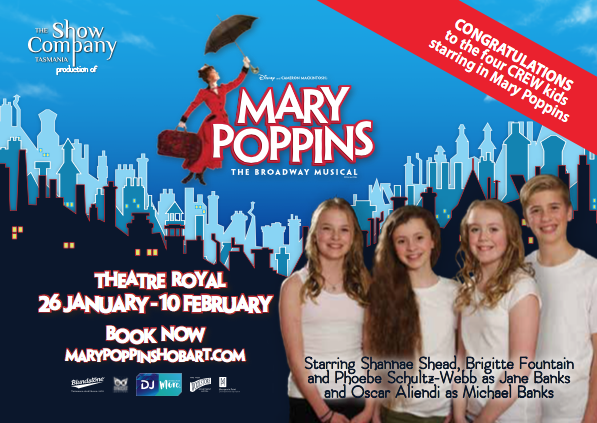 As well as running MTCrew, Allan Jeffrey and Leiz Moore are co-producers with the award-winning The Show Company, which brought the magical MARY POPPINS to Hobart's Theatre Royal in January 2018. Allan directed the show (having won Best Direction for Community Musical Theatre for WICKED in 2017) and Leiz choreograph with the Crew's award-winning choreographer, Mandy Lowrie. The Show Company's production of WICKED was nominated for 10 Tasmanian Theatre Awards winning a record 5 awards including Best Production, Best Musical Direction and Best Ensemble - with the cast featuring nine 'graduates' of the Musical Theatre Crew! Elphaba made folks green with envy with actress Nicole Simms-Farrow winning the Tas Theatre Award for 'Best Performance in a Lead (female) Role'. Galinda said, 'WICKED 2017 was thrillifying!' and actress Melinda Briton dazzled in the role garnering Tas Theatre Award nomination for 'Best Performance in a Lead (female) Role'. We had wonderful adventures in 2016 - thanks for joining us on the journey! Our very own CREW ELVES preparing for the Christmas Pageant 2016 with the Lord Mayor! Crew Elves River, Josh and Charlotte with Bonnie Cashion, Crew Graduate who will play the alternate Elphaba in WICKED Jan 2017. ‘Loved it! Such an energetic show! Beautiful voices and great dancers! The dog was pretty cute too! 2015 COMMUNITY MUSICAL THEATRE AWARDS - WINNER: Best Choreography, NOMINATED: Best Production, Direction, Ensemble, Musical and Design! Nov 2014 - Proudly presented by members of the Junior Performance Ensemble aged 7-13 years old - loads of fun 'Under the Sea'!